Finger injuries don’t just happen to kids who are athletes. While it’s common for fingers to get “jammed” by a basketball or when diving back into first base, fingers are susceptible to getting caught in the car door, slammed in a drawer or even accidentally stepped on. Many parents are quick to shrug off a finger injury if it doesn’t look broken. You might even hear a parent say, “Oh, it’s just a finger. It will be OK.” However, a more serious injury could be lurking. Why is it important for my child to be treated for a finger injury? Just because your child’s finger may not look like it is broken, it is still important to have it looked at by a professional. The bones of the hand are quite small, and fragile. But, the bones aren’t the only thing in the hand that can be injured. There are also several ligaments and tendons in the hand that are at risk for injury. A ligament connects bones to other bones and their job is to support the bones and joints, and in some cases, prevent certain movements. If a ligament is injured and not allowed to heal, it can cause the bones to be unstable which can lead to further injury. When should I get help for my child that has injured their hand or finger? If your child’s finger looks like it is out of place. If there is any bruising, swelling, or pain that lasts more than a couple of days. If your child is unable to bend or straighten the finger. If your child is favoring that hand or finger and doesn’t want to use it in everyday activities. If your child injures their finger and it looks to be out of place, you should seek immediate attention from a medical professional. Do not try to put the finger back into place on your own. You could cause further damage. 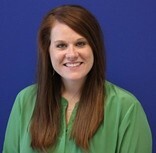 Cara Smith, PT, CHT, is a certified hand therapist and the Hand Therapy Program coordinator for the SPORTS program at Cook Children's. 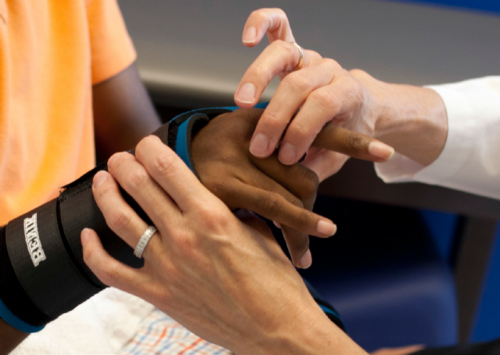 At Cook Children’s, we have a team of providers that are trained in treating kids with hand injuries. Pam Sherman, M.D., is an orthopedic surgeon who is also board certified in hand surgery. We also have hand therapists on staff that helps rehabilitate children, adolescents, and teenagers following an injury to their hand..